Before I start this post, I have to say I’m tired. Knackered. Exhausted. My mind is completely foggy and I should get some sleep (but blogging is way more interesting), so excuse me if this post isn’t all too great. 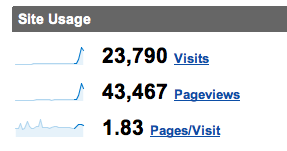 That’s like more than 10 times the amount of visitors I got in one year! I’m only hoping those visitors also took the time to see the rest of this blog and will be coming back for more delicious geekiness. A warm welcome to all you new Stumbled readers out there; I hope I can entertain you. Why have I been quiet the past few days? Monday I’m getting my second wisdom tooth removed, which I’m getting done here in the Netherlands (better insurance, cheaper, etc etc). Seeing that I live in London, means having to undergo a nice “little” trip from there to here. Now most of the time I go during the day with the bus; although it isn’t as great as going by plane or train, it’s a whole lot cheaper and still doable. This time though I was a bit late with booking and decided to go with the night bus. Yeah, not a good idea, that. The bus was completely full. I luckily got a window seat, but got stuck next to a kid who tried to curl up in her seat and played the most annoying hip-hop/rap music (using of course the terrible white iPod headphones). Of course, I also had to pick the one seat in the bus that wouldn’t recline properly. Then to make things worse, a mother and her 3 kids were sitting behind me and at times the youngest was crying, screaming and screeching. I’ve never experienced a more annoying child than that one. Suffice to say, I barely slept that night. I got at my parent’s place at about 11 this morning and just went straight to sleep. Woke up at 6 and now (at 3 in the morning) I’m again completely exhausted. Tomorrow though I should be back in blogger mode and I’ll be posting a couple of items, including a review of Be Kind, Rewind and your weekly Trailerrific.